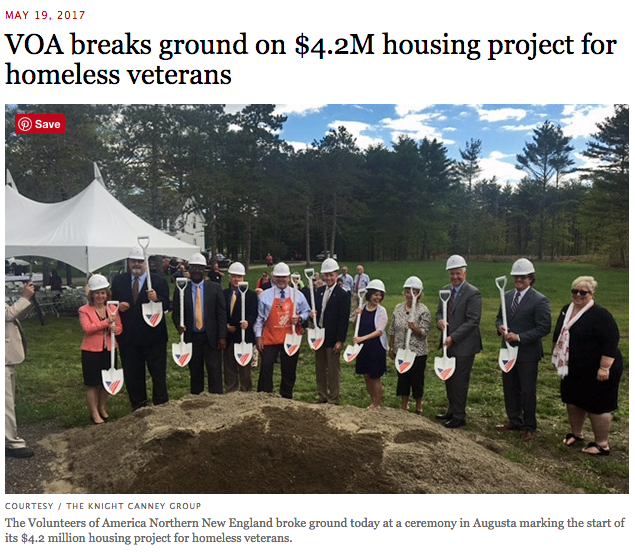 Twenty-one Maine veterans and their families will have brand-new, energy-efficient, ADA-accessible cabins to call home once construction is completed on the "Cabin in the Woods" development being created by the Volunteers of America Northern New England in Augusta. The Brunswick-based nonprofit broke ground today on the $4.2 million project located on the grounds of the Togus VA Medical Center in Augusta. "Some of our military veterans need a quiet place to help them transition into a daily routine," June Koegel, president and CEO of Volunteers of America Northern New England, said in a news release. "Cabin in the Woods, along with other support services will help them achieve that. Permanent housing with easy proximity to the services available at Togus is invaluable to someone struggling to re-establish their place in society." When completed, the Cabin in the Woods development will have 16 one-bedroom and five two-bedroom cabins spread over 11 acres, each with its own wooded, private setting, available to homeless Maine veterans — both men and women. The project is funded primarily through Maine Housing with additional donations from The Home Depot and TD Bank Charitable Foundations, as well as funding from the U.S. Department of Veterans Affairs. The land for the Cabin in the Woods development was acquired through the Department of Veterans Affairs Enhanced Use Lease Program, where the VA leases underutilized real estate to the private sector for the purpose of developing housing for homeless veterans. Volunteers of America Northern New England already operates two successful veterans programs in the Saco-Biddeford area; The Arthur B. Huot House, which provides co-ed transitional housing for homeless veterans, and The Veterans Career House, which serves homeless male veterans.